On the night of Jan 31th, 2018, do go out and take a look at the moon. It will be full and will seem either to be a bit brighter than usual, or very faint and red. In either case, it will be a blue moon. Confused? Let me help you. Let’s first do the easy bit: if it is faint and red, you will be looking at the lunar eclipse. There will be a total eclipse of the moon that night. This happens when the moon passes through the shadow of the Earth. Wherever the moon is above the horizon, its light seems to go out. But it does not become entirely invisible, because the Earth’s atmosphere bends light that passes through it a bit, and that bended light still reaches the moon. Imagine the moon being illuminated by all the sunsets and sunrises all around the world, simultaneously: it will not be a surprise that the moon becomes reddish to the eye. And the more volcanic dust there is in the air, the darker the moon becomes. After Krakatoa, the moon almost became invisible during total eclipses. The redness of the eclipsed moon can vary and is not easy to predict in advance. A red moon during total eclipse is sometimes called (at least in the US) a ‘blood moon’. 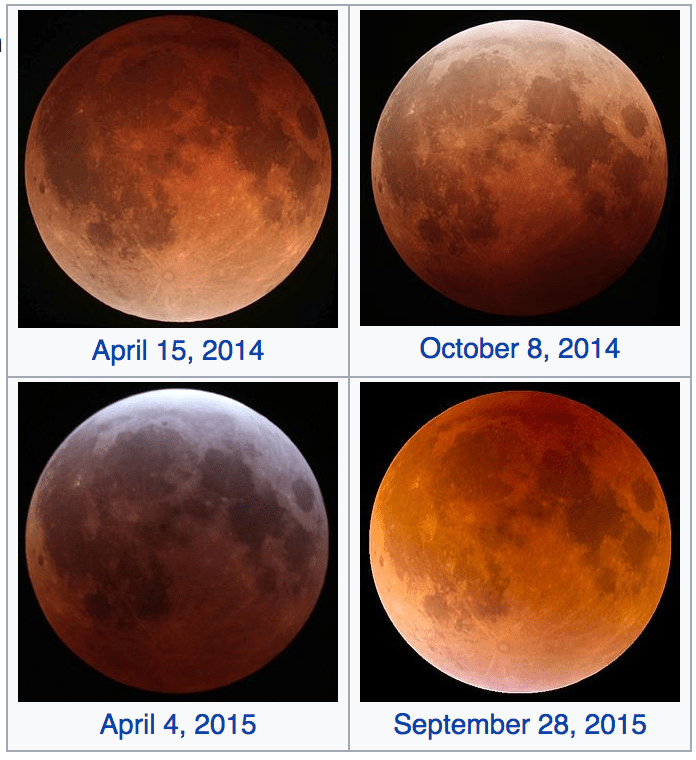 Lunar eclipses are among the few (regular) astronomical events that can be seen from within our cities. To see most stars, the occasional comet, auroral light – it really requires getting away from artificial lights (and from alcohol – it is amazing how much alcohol affects night vision). Your eyes will take about 15 minutes to adjust to the dark and reach maximum sensitivity. At astronomical observatories, cars drive around at night without their lights on, which can be scary when you know that the road follows the top of a cliff but you are not quite sure where the road is. In emergencies, you are allowed to use the indicators to see by. But the full moon is bright, and wipes out the vision of the dark sky as effectively as any city. The total eclipse of Jan 31 will not be visible everywhere on Earth. Europe, Africa and South America will miss out. Alaska, Hawaii and the western Pacific are perfect places to see it. If there is no eclipse, the moon will instead appear to be unusually bright. This is because it will be a bit closer to Earth than usual. The orbit of the moon is elliptical and therefore it is not always the same distance from us. It is not easily notable: it makes the moon appear a bit larger and smaller over the month but this is hard to see. But if closest approach coincides with a full moon, the closeness makes the moon appear quite a bit brighter. The moon will reach closest approach on Jan 30 when it is 358,900 km from Earth. The average distance is 382,900 km. Therefore, it will be 7% closer to us and 14% brighter than an average full moon. (In fact closest approach will be one day before full moon but it will still be notable the next day.) This is not extreme: in December 2052 there will be a full moon as close as 356,424 km – the ellipticity of the orbit varies a little and not all closest approaches are the same (the average closest approach is at 362,508 km). In recent years, the closest approach has been called a ‘super moon’. The definition of a ‘super moon’ is a bit fuzzy (actually, very fuzzy: it is not a term used in astronomy but was invented for astrology), but the term may be used if the moon comes closer than 360,000 km. No worries, it doesn’t affect us: the tides may be a few centimeters higher (added to the spring tide) but that is about it. (If you are more worried about this than about sea level rise from global warming, then you may want to reconsider.) This makes the Jan 31 full moon a ‘blood super moon’ – just about. But there is more. The full moon of Jan 31 will be the second full moon this January, after the one on Jan 1st. To have two full moons in one calendar month is not all that common. In recent decades, since about 1980, the second full moon within one month has been called a ‘blue moon’. So if you weren’t confused enough, we now have a ‘blue blood super moon’: it will be red, blue and big all at the same time! Again, to be more precise, this complexity will not be true everywhere. If you have the misfortune to live in eastern Australia, or the fortune to live in New Zealand, Feb 1 will arrive before 13:27 GMT and so for you the full moon will happen in February – and it won’t be blue. As compensation, you will have a superb view of the total eclipse. From experience, we know that the sky is blue, the sun yellow, and the moon grey. Seen through cloud, the sun or moon change brightness but their colour does not change, although it becomes harder to discern the colour. Only at sunset (or for early risers, sunrise) can we see a red sun, caused by absorption and scattering of blue light in the atmosphere. The air molecules, water droplets and dust particles affect blue light more than they do red. With a long path through the atmosphere, red light gets through but blue light is scattered. The result is a red sun, whilst the scattered light makes the sky blue. There is however an exception. Particles of size around 1 micron affect red light more than blue. This unusual situation makes the moon or sun appear bluer. It would not be notable against a blue sky, but in such conditions the sky will become greyish (and perhaps even red): the contrast between the sky and sun makes the sun appear blue. It is magnified by the tendency of the human eye to assign colours in contrast. Photographs (this one from Brisbane, 2009) of the effect often show a blue haze around the sun as well. To the eye the colour is marked. It only works if the particles are of quite uniform size: mix grains of sizes which are different by more than 50% and the effect goes away. The moon was in a slightly misty sky and had a kind of lovely blue color comparable to the electric glow discharge. I never saw something similar before. Many people have suggested that the English expression ‘Once in a blue moon’ referred to rare events like this. It describes something that happens very rarely, but which is not impossible. But its history is more complex – and more obscure. How old is the expression ‘blue moon’? This depiction of London slang gives a unique sound bite of the street language, very different from normal written work of the day. 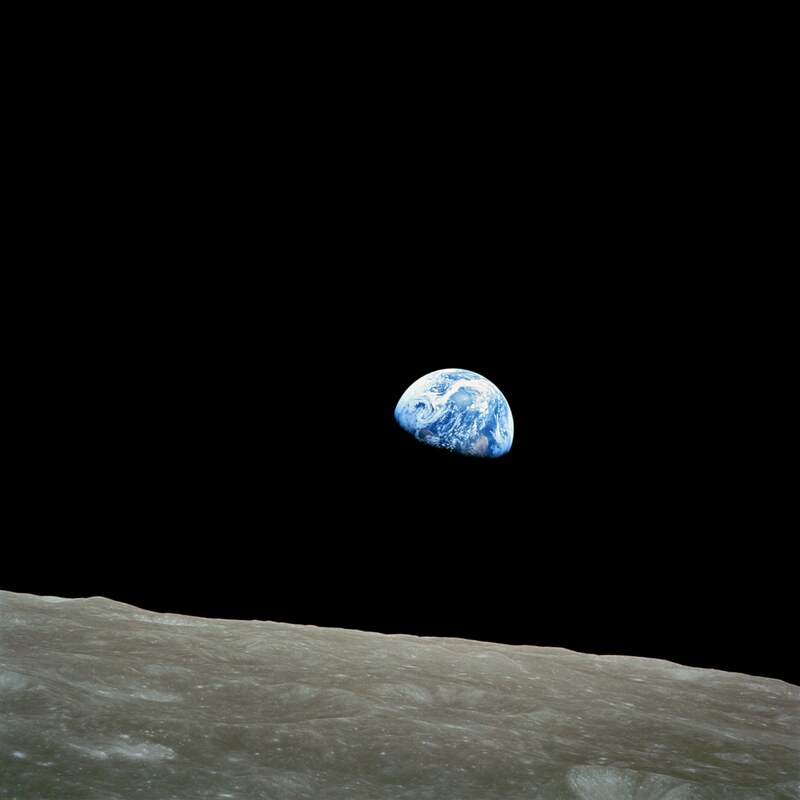 Still, this particular phrase required a footnote provided by Egan, stating that ‘blue moon’ meant ‘a long time’. The expression was not commonly known, apparently. I found no earlier mention, and it is therefore likely that the expression arose in London slang around or shortly before 1820. The suggestion has been made that it developed from an earlier expression ‘once in a moon’, with ‘blue added to describe something much rarer than monthly. The text says that these are people who hold themselves above the world, god and scripture, and they think that if they declare the moon is blue, we should believe it. So in this context a blue moon is make-believe. It is just not true. This does not seem related to the later meaning of a ‘long time’. It appears that this use of ‘blue moon’ never caught on. It did not become adopted into the English language until it was re-invented in London, 300 years later, now with the meaning of a ‘long time’. These gentry, who would have sat interested for that indefinite period known as a blue moon, had the talk been of markets, and prices, and quotations, at length thought it time to vary the intellectual repast, and one of them suggested that somebody should sing a song. Published in 1876, Mary Elizabeth Braddon’s book Joshua Haggard’s Daughter, contains the line Why should she stint as to one or two puddings a week . . . and a fruit pasty once in a blue moon. In 1884, Robert Francillon, Ropes of Sand, says: I’ve made bold to take the chance of your being at home for once in a blue moon, Mr. Carew,’ said she. The expression thus survived and was in use, but it was not particularly common. All four authors lived in London, confirming the local origin of the phrase. There is a very old Norfolk saying, once in a blue moon. Can it have had its origin in the actual and yet very infrequent observation of that phenomenon? Or is it a mere random shot at an illustration of rare events? The moon here in November was of the intensest sapphire blue, the perfect clear sky looking rather slaty. This morning at 6:30 there was a fine sky-glow, and so last week. It certainly appeared to come from aqeous vapour. (taken from Wilson, 1946). This is from Norfolk, Ontario (not the UK), an agricultural area attracting immigrants from poorer areas in the UK: Scotland, Devon, Cornwall, amongst others. The text shows that the expression was well known, but by now the origin had been lost. The Maine Farmers’ Almanac (a publication that existed from 1819 until 1967) was the first to give it a specific definition. There is a long tradition in North America to give each full moon in a year a name. Examples are hunter’s moon (October) harvest moon (September), lenten moon (last full moon of winter), and Easter moon (first full moon of spring). Different names were used in different regions. Each of the four seasons should have three full moons. But some years have 13 rather than 12 full Moons, and in those years there must be one season with four rather than three. This throws the naming out of kilter with the agricultural year. The almanac used the term ‘blue moon’ for the third (not the fourth!) full moon in a season of four. It is not clear when this was first introduced but it was in use by 1915. An article describing the detective work involved appeared in finding this obscure source is in Sky and Telescope in 2006. The custom to give names to full moons was found mainly in North America, and mainly in rural areas (where working outside at night becomes possible only with a full moon). Therefore, this specific definition may well come from Maine or from a nearby area. The date is unclear, and neither is it known whether there is an oral tradition behind it or that this definition was invented by one of the Almanac editors. This article includes a fair amount of unproven speculation. It was indeed the task of the priests to keep track of the calendars, and already in Jewish time they would order the insertion of a 13th (lunar) month when the seasons and the lunar calendar had clearly gone out of sync. Under the Julian and Gregorian calendars, their role was limited to the ecclesiastical year. But there is no evidence that in medieval times the extra lunar cycles were called ‘blue moons’, or that full moons were given names. The origin of 13 as ‘unlucky number’ is unknown: the claim that it refers to an extra lunar month does not have any other source t back it up. Neither is there support for the claim that it was the Almanac that was the origin of the term “Once in a blue moon”. What is clear is that this expression was well known in 1937, but that the origin had become obscure. The definition changed again in 1946, this time through a mistake. An article in Sky and Telescope tried to answer a reader’s question on the definition of a blue moon. The answer was based on the usage in the Maine almanac, as explained the 1937 article, but the author misunderstood the explanation. He believed it was used for the second full moon in a calendar month. The magazine repeated this altered definition in a 1950 article. It resurfaced in a 1980 radio show, became incorporated in a Trivial Pursuit question, and from there made it into modern ‘knowledge’. The article in Sky and Telescope which explains some of this history is apologetic in tone, but does not retract the new definition. How could it, if it had become part of Trivial Pursuit? The earlier definition was much more useful, though. The Almanac had defined the seasons as starting at the solstices and equinoxes, using a mean motion of the Sun (correcting for the Earth’s elliptical orbit around the sun, with its varying speed). These are moments in time everyone can agree on. Instead, the new definition depends on location. A full moon may occur on different dates, depending on the time zone. This, in 2018 there is twice a second full moon within a calendar month, on January 31 and again on March 31 (unusually close together, thanks to February having no full moon). But, in New Zealand, these full moons will occur on Feb 1st and April 1st, and according to this definition, neither will be ‘blue’. True coloured moons (or suns) are rare. Regions with frequent dust storms or extreme pollution may see it more, but areas which depend on chance smoke from the right kind of fires or ash from just the right volcano may experience it perhaps once a century. The figurative blue moon, such as that of Jan 31, occurs more frequently than that. 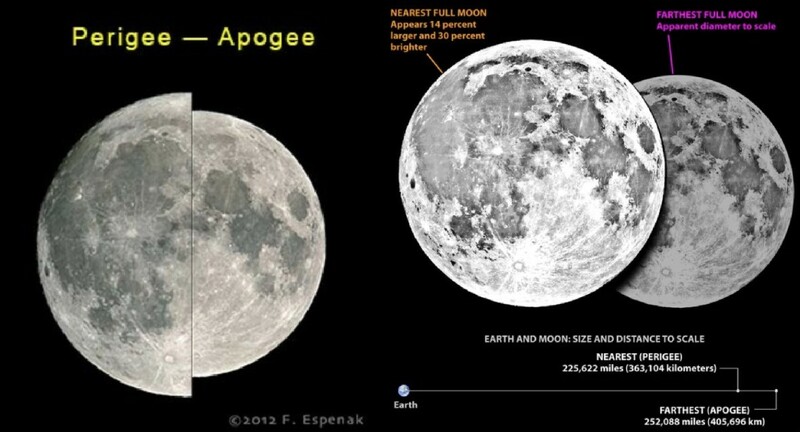 Full moons are 29.53 days apart, and the average length of a month is 30.43 days. Some months are longer than others, and have a higher chance of a second full moon in one month (February, on the other hand, can never have two and occasionally has none). The time between two full moons varies through the year, from 29.27 to 29.83 days. Steve Holmes (2011) put this together and found that each month has a chance of 3.28% of ‘being blue’. A second full moon in one calendar month can therefore happen on average once every 30.48 months. Using the older definition, of four full moons in a season, blue moons occur a little less often. Each calendar year has a 36.85% chance of having a 13th full moon. Such a blue moon will happen on average once every 32.56 months. Type ‘once in a blue moon’ into the google search bar, and it will helpfully give you a numerical answer: 1.16699016 × 10-8 hertz, which is equal to 991.788 days or 32.59 months. It does not say which definition is used. If it is the modern one, of two full moons in a month, google would be wrong and this would be inconceivable. Clearly, it used the older (better) definition. So how often is ‘once in a blue moon’? It is about once every 2.7 years. There are roughly 35 volcanic eruption on Earth per year. So ‘once in a blue moon’ is approximately ‘once every 100 eruptions’. And that should be an easy one to remember. I live in Wiltshire where locals (particularly round Devizes) are called Moonrakers. When I first heard this expression (back in the 1950’s) it meant that the locals were a bit dim in the head. The story then was that a man passing a village pond at the time of a full moon saw some farm labourers raking the water. He stopped and asked them what they were doing and they said they were trying to rake “that gurt [great] cheese” out of the water. This was a sign of the simple-minds of agricultural workers. Much of Britain’s history was revised in the 1960’s and now the explanation is of local people out-witting the local Excise Men. The story now goes that locals were smugglers and had hidden their stash (probably rum) in the pond. The local Excise Men found them but they pretended to be daft and raking for the “gurt cheese in the water” so they were let off. Sometimes the stories of the ‘green cheese moon’ is said to be the origin of the ‘blue moon’ expression. This seems very unlikely: they have very different meanings and histories. In conclusion, the expression ‘once in a blue moon’ does not come from astronomy, nor from volcanology. It was a London colloquialism, dating from around 1820, but there was no observation or definition behind it. The suggestion that it derived from a medieval tradition, related to the ecclesiastical lunar calendar, has no supporting evidence of which I am aware. Instead, the astronomy was added later, perhaps by an editor of an American almanac (who sometimes were astronomers), and redefined erroneously in a popular astronomy magazine. Astronomy adopted an orphaned expression and gave it a new home. Looking forward to the event. We will not have the full eclipse in Atlanta Ga but it will be visible while putting the children on the bus in the morning. There has been a little flurry of activity at Kilauea with around 18 mostly small quakes in around 7 hours around the vent with the last two a 2.6 and 2.7. ‘Moonrakers’ is also a nickname for the people of Middleton (between Manchester and Rochdale) as well as Devizes, so clearly the Wiltshire folk weren’t being left to their own devizes on that..
As far as Manchester is concerned, it will be blue for some time to come. How did the moonrakers end up in Middleton? 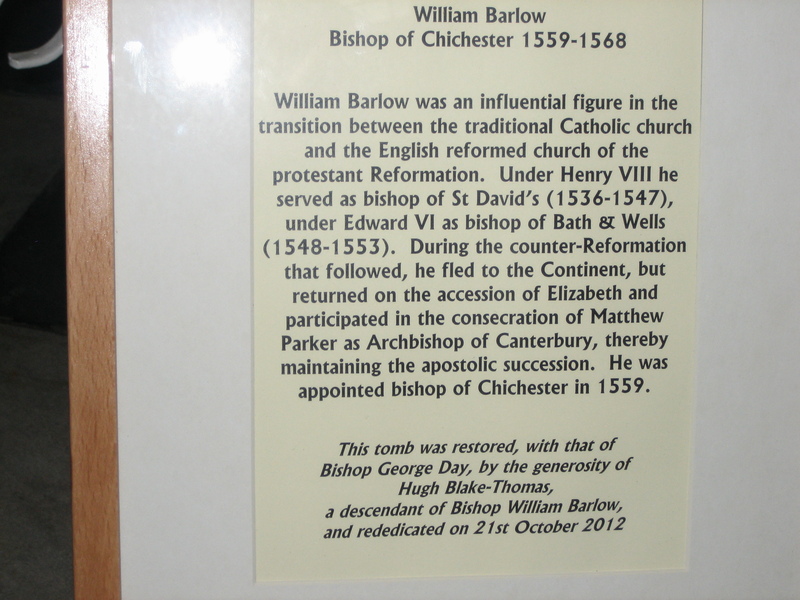 Wikipedia links it to Devizes – but there seems very little information other than wikipedia available. Of course, it also a word for the top sail of an old sailing ship – the one that seems literally over the top. I don’t have much on this; google Moonrakers Middleton and you will see plenty of ‘secondary’ references eg a local pub called the Moonraker, the local cricket club nicknamed the Moonrakers, etc etc. Obviously a widespread nickname (just as Heywood down the road is called ‘monkey town) but the origin remains obscure. Gah! “Middletown”. I walked from Leonardo to there angry and drunk late one night. It was near some religious holiday and all the graves in a cemetery I passed by had small blue or red candles at the headstones. Unrelated to the folklore, but the road name was sleepyhollow. I was suitibly weirded out by that. The real sleepyhollow is up in New York, not Jersey. I am a regular reader and find this article especially interesting. I like the twists of languages. By the way, the German expression ‘working a blue Monday’ is ‘einen blauen Montag machen’ in German. This translates literally as ‘making a blue Monday’ and means that somebody does not go to work at all after a weekend with parties and drinking. I think it is still steadily enlarging but otherwise it has been fairly quiet. Hard to tell how long this will last. These big ones do take their time. There was a shallow M2 inside the caldera. Bali has some seriously strange weather. Yes, I know, tropics. Weird glow on Tulamben cam in same location, but this time it is 1:30 PM rather than 4:30PM. might be cloud reflection. Tulamben is on the opposite side of the mountain from the previous. Seems like there is some ash in there, Not sure how much. Is it just me, or has this swarm been active at the same spot for years now? If so, what may be the explanation for this sort of localized tectonic swarms, and the long duration? Is it a sort of semi-slow slip? Yes, this is a regular occurrence, every few year. It is a transform fault, zig-zagging a bit, and both this location and 20k away underneath Grimsey island have regular slippage event. It is accommodating a fair fraction of the spreading of Iceland. Agung appears to be erupting and maybe not limited to the summit. Either that or an extremely strange thunderstorm. Peak of the mountain is right above the pointy top of the smaller of the two buildings in the foreground. Smooth drumplot lines – No major event? Where are the seismometers located? It would be very interesting to see the 3D modeling like we have for the Icelandic volcanoes. If I knew, I’d be in it… really slowly. I assume this is hill cloud. A conical volcano can make its own weather by forcing the air to go up and about. Remember it is still the wet season and clouds form easily. Some effect from the summit heat may still be there but I don’t think it affecting this cloud. 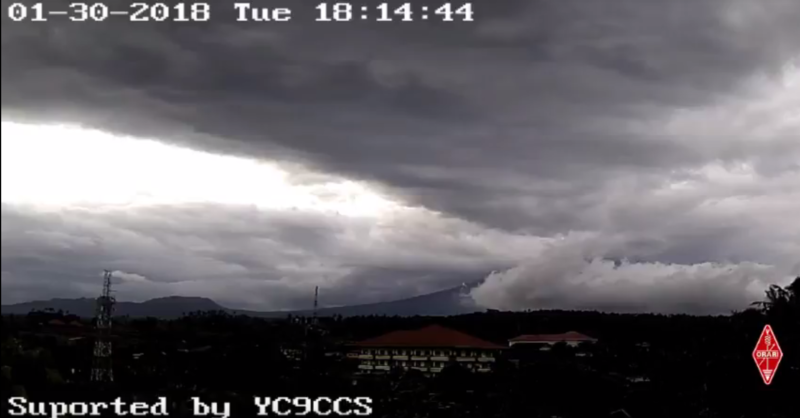 The hill cloud seems to be forming over the valley possibly between Agung and the mountain to the east. That’s why I posted it, it is NOT over the summit, it is over a valley. Do hill clouds do that? Edit: mountain to the west. This camera is facing north-ish, I believe. Did you know which the way the wind was? Re wind, clouds seemed to be coming towards the camera fairly consistently. Agung seismo is again giving the impression that the mountain may be somewhat less than happy? Difficult to be sure of anything with so much bad weather about, but it is dialled down in sensitivity and that looks like continual noise to me rather than quarry works/flood waters. Histogram & rsam graph http://agungcctv.brunswicktech.com.au/rsam also to my mind showing steady upward trends. Our daughter is off to the Philippines tomorrow, for a month of wandering around. I’m not sure I can persuade her to pop over to Mayon volcano, but if she has any news for me on it, I’ll pass it on! you may want to be cautious with the persuasion. The area is on a lahar watch, with fears that the recent rains have destabilised the ejecta from the recent eruptions. 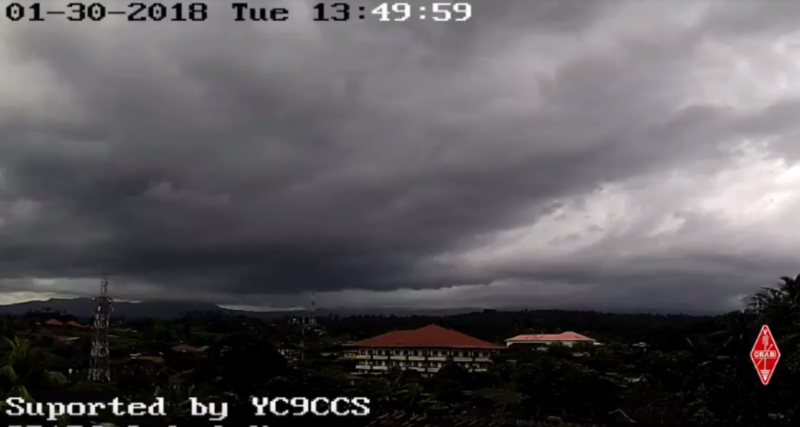 Yes – it’s a nasty situation around Mayon. Seriously, at 22, she’s more interested in beaches, restaurants, food, local society and exploring. I doubt I could get her anywhere near the volcano. But she knows my interest, so local news and information may be forthcoming! If you can convince her to keep a known freind around while exploring, it will be more enjoyable and safer experience. Oh, and don’t let anyone shine your tennis shoes. Yeah, try will come out glistening white, but they will fall apart in about 3 weeks. Their “polishing” of tennis shoes involves high power bleaches and detergent. Basically, if the service is offered from the street, be very cautious. Thanks! I’ll let her know. She’s gone off in a white set of trainers… She’s with three friends. Keep in mind that my experience is in the more seedy areas of the philipines and reflects a sailors point of view. The main industry there is to separate you from your money. I never got ripped off, but I could easily see the potential and steered clear. Not just a PI thing. Antigua, St Thomas, Dubai, Hurgada, Columbo, or any number of other ports have the same industry. Isn’t that what tourism is all about? It is the only way the locals benefit – getting hold of your valuables. The question is how much if the financial extraction is voluntary. Reports of lahars at El Mayon with some damage to roads. The wind is coming from the upper left (I think north or northwest). This pattern I’ve seen a bunch. That other cone is Batur which has shown it’s own signs of awakening. Last time Agung erupted Batur did also just after Agung I think. Sorry forget the history but it was the same year. Currently Agung is the one that can be destructive but Batur is inside an older caldera with a caldera lake so could easily show some fireworks of it’s own. Nobody really can guess. Here it is again, now there are clouds over both and I have no idea what the light blue fog is in the middle. If that is volcano generated, yes, eek. But it looks like a typical Florida squall set rolling though in summer. Could be severe storm. I’ve never lived in the tropics so even if it’s a thunderstorm it looks “eek” to me. seen ’em worse than this in UK ferchristsake! Ahhhhh, and I thought you lived in OZ, bummer. This was just Agung’s general Monsoon weather, no ash eruption, check Darwin ash advisory anytime you are unsure. The monsoon on Bali has been extra severe this year, no doubt could be linked to Agung’s eruption. Monsoons and Volcanoes are not a good mix and there has been flooding, lahars and also landslide this year. Yes, Most Definitely also weather. Read above. Agung had a burp around 15:55 . Should have said about 16:23. Seems like it’s still going. Either that or Bali has very weird weather. Looking like typical (well for the last 3 months at least) Bali weather to me – rainy season eases off come may/june apperently. Canthisbenull – out of interest, what part of the image are you referring to as the satellite cone? This would help me/others orientate themselves in regards to the cloud formations that you are speaking of? Not entirely sure where this cam is located, but i suspect the peak on the left, set between the two pylons may be Mt Batur in the distance? This cam is back up on line https://www.youtube.com/watch?v=E1utifJUt_0 and i think it’s the best when it is not tipping it down with rain. Be warned – there are some very suspicious cloud formations showing on this one for the past couple of hours but they are rain clouds. Seismo and spectrogram make me think that this is still a rather grumpy volcano. If it’s Batur activity between the two is a bit problematic, unless it’s just rain. Camera is called Core Orari Karangesem, I assume that means it is in Karangasem, but that’s also the name of the province, no? Unfortunately the province is about as far as i have got with it’s location as well. 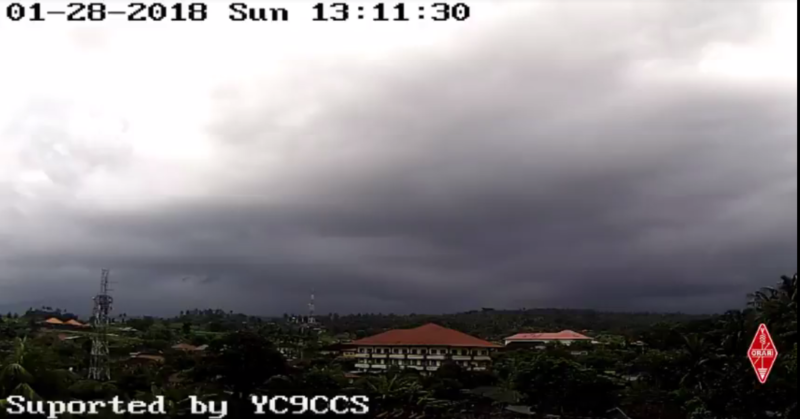 Based on crude comparisons of cloud and sun direction, I believe it is located further south than the bukit asah cam. If that is the case then it will be facing NW and so Batur could well be in shot – and the peak between the two towers does look to be a long way off. The rise directly behind the left most tower looks as if it is more to the foreground. This however is pure guess work on my part. The cloud you have been seeing is rain cloud due to very energetic convection, probably assisted by the prevailing wind pushing extremely humid air up over the mountains/hills. This can admittedly look very suspicious, especially if the sun catches it in the wrong way! 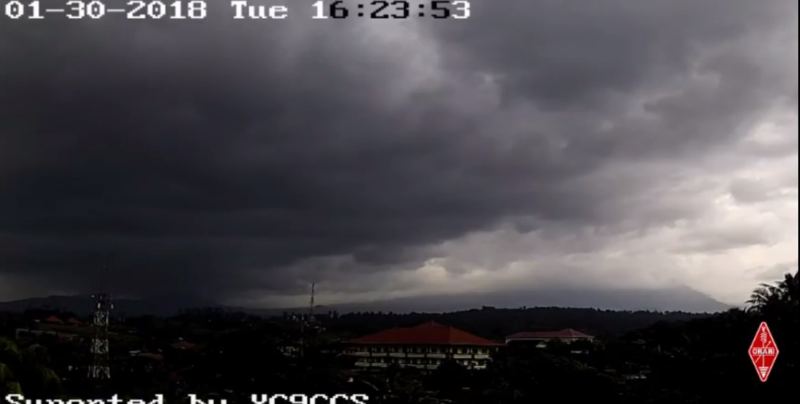 I had to take repeated views at the bukit asah cam earlier today in order to be certain that what i was seeing was weather. Your guess on the location is quite similar to mine. I considered it to be a similar angle to Bukit Asah but farther away. Batur has a cone-shaped mountain on the side of the lake closest to Agung, and the rest is flat (caldera containing a lake) so that would match the appearance. 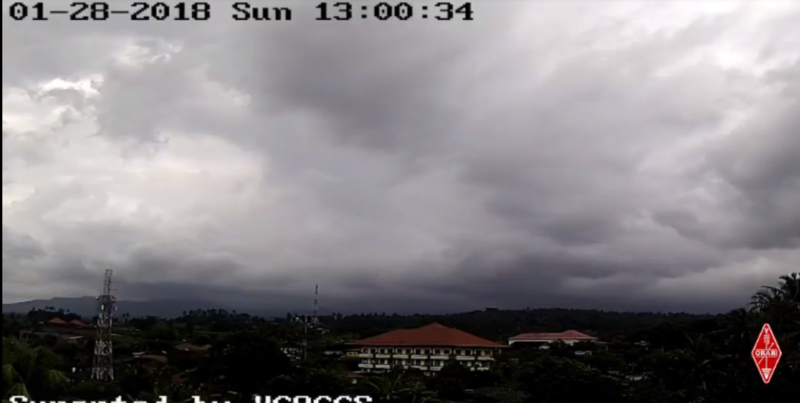 There is also a row of hills in the Bukit Asah camera that I thought might be the same as the ones here. I have been trying to locate the cameras on Google earth to get a sense of what the view is like from there. Hi canthisbenull – Bukit asah is i believe 8 29′ 41.96″ S 115 35′ 47.17″ E, google earth shows some pylons and view from there is a good match. 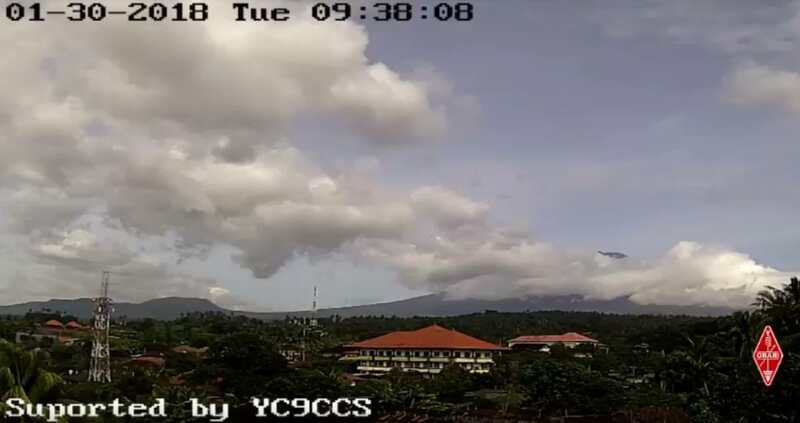 I tried looking at the mountain from downtown Karangasem (I looked for the two buildings on the Core Orari cam with red roofs) and there is a government building that seems to match the view, more or less. It’s an Amateur Radio Association. I’ve been looking at google earth from Karangesem. Those hills you see behind the radio tower are closer to town than Agung, but Batur is right behind them. Hope this link will help you as you are clearly concerned with Agung and ash emissions. Every photo you have posted above is normal monsoon weather or this year worse than usual. 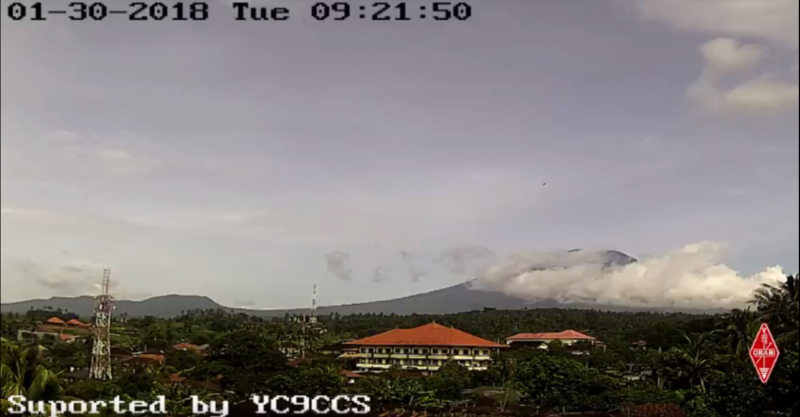 I understand your worry/excitement about Agung and yesterday at one point I thought I clearly saw ash from top of Agung, after watching for 5 minutes it was clear it was just blobs of darker cloud moving from the left behind the white foreground cloud and some even speculated a new vent had opened because the dark cloud was lower on the mountain. I have watched Agung since the start of the warnings and can reassure you that so far for the last few days at least Agung is biding his time until the next ash eruption. As it is so very difficult to tell if things are ash or cloud always check the ash advisory link above if you want to be sure, Darwin are extremely quick to put up notices of ash eruptions. They have to be because of danger to aircraft. Carry on enjoying Agung but currently he is a boring old man. It’s just low cloud. You can see that in the UK on many rainy days if you have a big enough view of the horizon. If was an ash cloud, you would be able to see ash fall from it. It’s now showing 3.8 and a 4.6. That one will probably leave the north side silent for a while. Maybe a couple of more stars in the aftershocks, but after that it will probably be weeks before the next large one. Funny thing is, believe it or not: earlier today I was about to point out that we could probably expect something like an M4.5 to happen soon, based on the cumulative seismic moment plot. I was interrupted before I started writing and then forgot about it. It is the third time this has happened to me. This is a lot bigger then I expected though. So, when do you thinkthe other side will follow? Very soon… The south side is falling a bit behind the north side. So far, since the end of the eruption, the energy release has been less than the north side by a fairly constant proportion. In order to keep up with the north side, I guesstimate that it would need to produce a single M4.6. Also, the south side has been relatively silent since the beginning of December, so it is definitely ready for a new M4+. Something like M4.5 in the next couple of days wouldn’t surprise me. I would be surprised though if there is no M4+ on the south side within the next two weeks. Also, I think these stars were all shallow compared to the usual one at this side. Ideas why? They are shallow but there have been other M4+ quakes in this area at this depth, such as last November. The real question is why they are getting larger. Assuming that the rate of inflation is constant, larger quakes may mean that a larger length of fault fails in one quake. The stress is getting more severe. Could it be that immediately after the eruption, inflation was taken up partly by the elasticity of the rock and partly by motion on the ring fault? As time goes on, less inflation is taken up by elasticity, instead motion on the ring fault increases resulting in larger quakes? We know that the ring fault is capable of producing >M5 quakes. Personally I like to believe that motion on the ring fault reduces the balloon type inflation and thus reduces the risk that it blows up Grimsvötn style. Instead, magma can be accumulated and saved for Holuhraun type events. I was wondering if they’ll go out and check BB? They have before when EQ’s were M4 like this after Holuhraun stopped. They took pictures and post them. I think that was in 2016. I see Iceland has some severe gale alerts out. I was under the impression the plug was RISING (ie inflating). Can we have this stated clearly or conversely if the plug is falling then ‘inflation’ is rather the wrong word. All the data I have seen points at re-inflation inside the caldera. This is also what you would expect: after Holuhraun, the area was left underpressured and so it is open to new magma. Assuming that it should recover fully within a century, inflation rates of a meter per year would not be unexpected. But there is no working GPS inside the caldera, as far as I know. A problem is that there is still a few hundred meters of ice on top of the caldera floor. Ice will move around and hide any slow changes in the rock below, so a GPS will probably not work. What is needed is radar measurements of the caldera floor, like the ones that were recently done at Öraefajökull. I’m convinced that the quakes are due to reinflation. One clear indicator of this is that the centroid moment tensors have switched polarity compared to ones during the eruption. This suggests that the movement is opposite to that during the eruption. Only one post eruption quake has so far ended up in the global centroid moment tensor catalog and that is from September 7. The image below is a screenshot from a search in the CMT database. It shows one quake from the eruption and one post eruption quake. Notice how the polarity of the beach ball is reversed. Pity you have to wait 100 years, ah well…. We have a similar system in the north pacific, and probably elsewhere so maybe not as unusual as one might imagine. Tenerife would be an impressive one if that works/worked that way…. Thanks Edward! It is also worth noting that all beach balls of large quakes in the decades before the eruption (the famous series of non double couple M5+ quakes) also had opposite polarity compared to the quakes during the eruption. Mauna Loa is playing up somewhat. 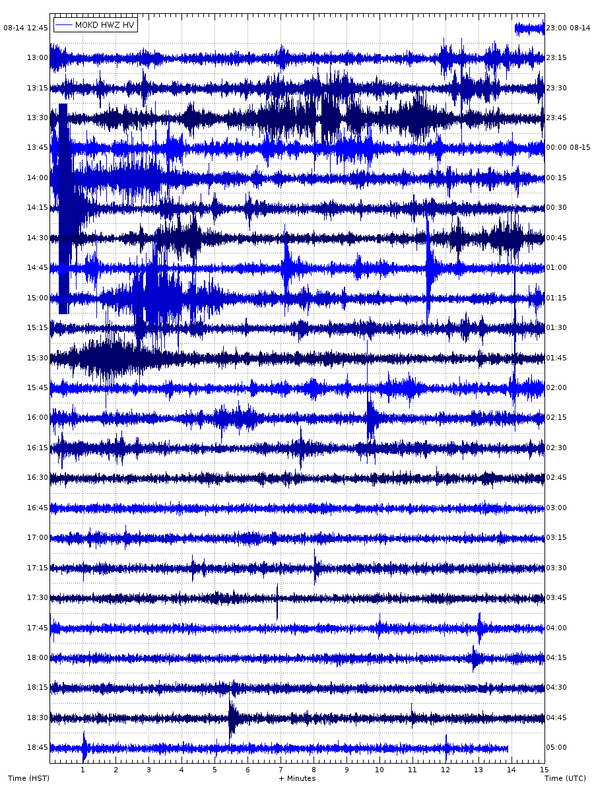 This is from the seismograph on the north side the caldera. The signal is also seen along the southwest rift. This looks significant given that it is increasing over time and up to now. I dont know how deep it is though so it might not mean anything. If it is deeper or level with sea level then this could be big. Signal showing on many of the plots. Seems the “cleanest” near TOUO, MOKD, RCOD, and DAND, and don’t ask me the definition of “cleanest” or what it could mean. Just my eyes looking for a pattern. Also wondering why the WILD seismograph, which is the closest to MOKD is showing much of nothing? It is petering out now. The activity coincided with a pronounced changed in tilt from which it has now recovered. Definitely some movement of the magma but nothing major. Oscillation on top of increased inflation rate ? Wonder if these redclipped quakes are local or signals from larger distant events? Those are from a couple of large quakes further east from Bali. One M5.1 and one M5.2. You can check the Magma Indonesia webpage. 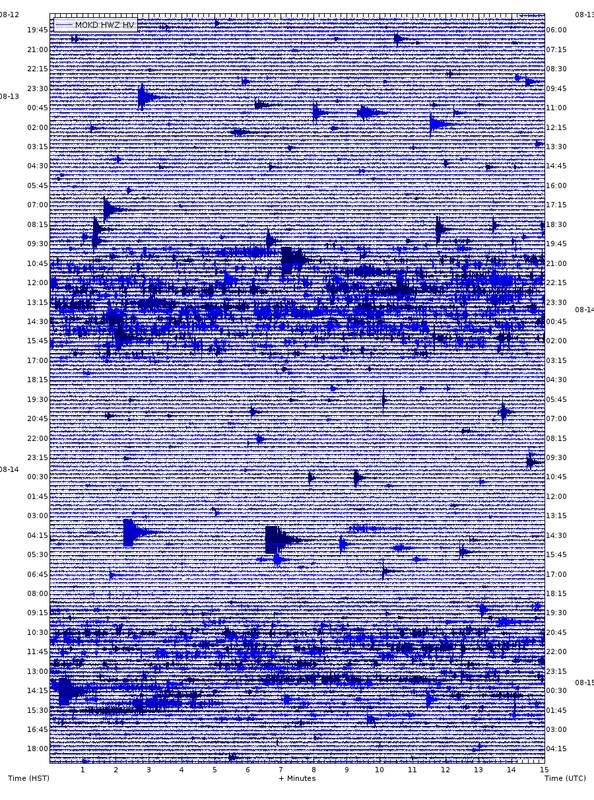 They are also visible on other seismograms. Yes, that became apparent later when the other graphs went back online.. 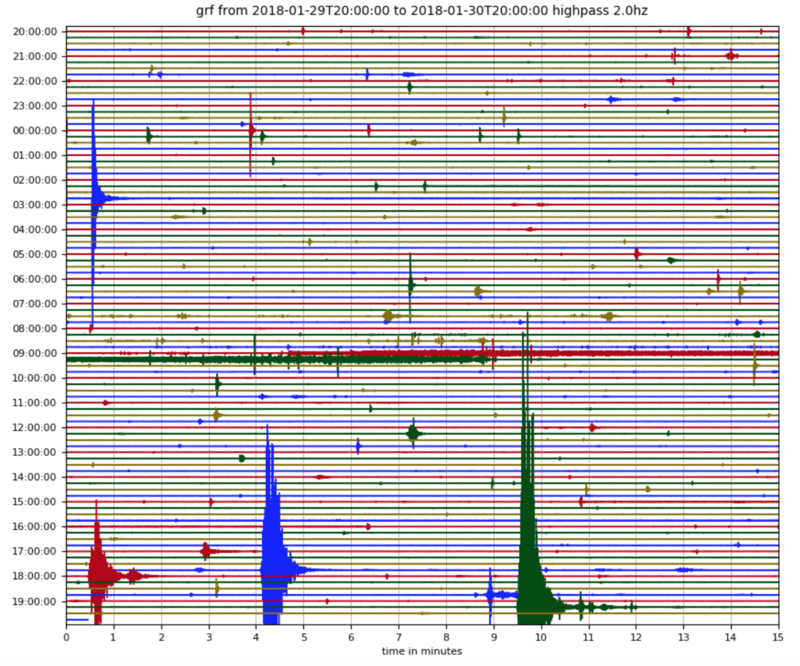 I have been told by someone living in the area of the need to be aware that the Batur seismo also shows mining activity that apparently there continues day AND night. It appears impossible to find a seismo on Bali that isn’t distorted by mining signals. Obviously both volcanoes bring a lot of wealth with the sand and other debris from the volcanoes and as most Balinese are very poor people many have little choice but to work in somewhat dangerous conditions. Here’s a January 30, 2018 video of Mayon I came across on youtube. Looks pretty at night. Not quite sure who posted it. 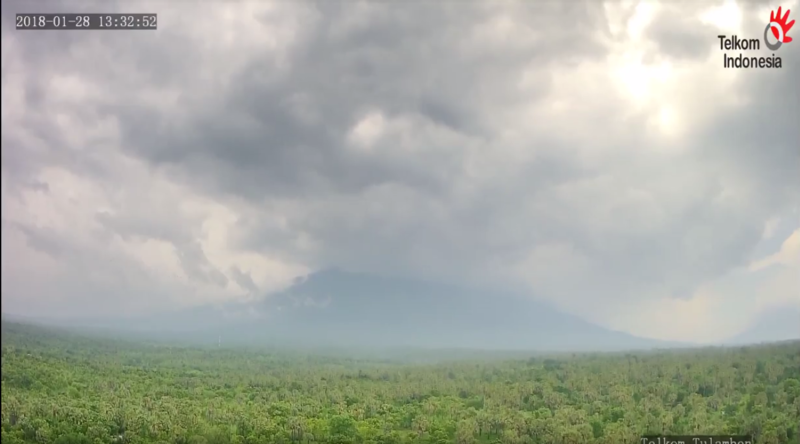 It has “Mount Agung Time-Lapse” in ID’s place. There is no lunar eclipse over Europe – mainly America. Not gonna happen for me. Laid back up in the hospital dealing with an infection. Decorum says to be. Most of my RN crew are ensigns and JGs. They have a few Corpsmen assisting, so assistance isn’t that far away. Oh no – get yourself better ASAP. Post Op infection is no joke. You got to fight it mentally as well as with the meds. Keep us posted please. Just give your immunesystem some time and those nasty bugs will be exterminated! They tweaked the antibiotic iv a bit to nail the specific strain. Doc is thinking a Friday departure. I am glad to hear it is getting cured. All volcanoes are behaving in your absence, waiting for your return. Looks a bit like Supermario too! Interesting event on seismograph for Sangeang Api around 2300 UTC, but not report of activity yet. PVMBG has changed the live feed from TMKS to DUKU. Duku station is located on the northeast slope of Agung. TMKS is down, or has poor signal at least. And by the look of it DUKU shows us very little of what is actually happening around Agung! checked camera a few times, nothing happening. DUKU is almost exactly opposite on the north flank of Agung away from that blasted active ‘sand’ mining operation that’s been interfering with TMKS. What’s great about the move, now that Agung has entered its next wait-and-see phase, is that it might be possible to detect smaller quakes in the day time. Unfortunately, the DUKU station got struck by lightning! Now all that needs to happen is for it to get stronger and in a few weeks watch the new show, and a probable disaster unless you dont mind fluorine poisoning and acid rain. 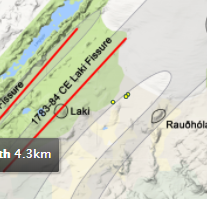 The quakes are aligned along the fissures though so maybe its not so far fetched?… Grimsvotn is a beast of a volcano and it has recieved enough new magma to pull off a VEI 4+ after only 7 years of not erupting, and then still be inflating afterwards (I think). And then theres thordaryna to the SW which is probably just as capable and might be (probably is) where the skaftar fires actually originated from. Indeed, three quakes are not the best indicator of future activity. However, this is the quiet ‘Deadzone’ and any quake (including the recent one on Bardy’s fissure swarm below) are always noted in the dragon back-channel. If things do get funky (not an official geological term) expect a post on the subject. I guess if an eruption does actually result from this it would support Carl’s hypothesis of the eruptions along the south Iceland volcanic zone being derived by vertical dykes from the mantle and not long distance feeding like for smaller eruptions. Maybe that is why flood basalts happen in Iceland but not in Ethiopia where the tectonics are otherwise very similar. Eruptions in Ethiopia are fed long distance through dykes and so don’t have the volume to form large lava flows after dyke formation, while in Iceland the bottom of the south Iceland volcanic zone is full of magma at the crust/mantle boundary which surged out of any fissure which reaches it. I guess the magma is derived from a central volcano location but not necessarily by a direct dyke intrusion from said volcano immediately before. That might explain why eldgja still had katla composition magma far from katla itself, the magma was flowing along the crust mantle boundary along the fissure swarm. The funky mental exercise, is to concider that “TDZ” has been undergoing about 18 mm of extensive stress for a long time. Magma has had time to ooze in and fill the voids, and for the most part, keep the region aseismic. What happens if either of the major plates experiences a sudden shift in motion and momentarily TDZ goes into a quick compressive stress setting? This could be caused by anything from a major quake in one of the large boundary plates, the shift of a pole of rotation… or one of the microplates between the large plates suffering what amounts to a state change, such as calving off a shard. Note, half of this is prescribed meds talking. Take it with a grain of salt. Status; evidently better. I pissed off my wife. There’s been a few interesting earthquakes around Grimsvotn and Haabunga in the past couple of days. No worries, she never reads science blogs. I’m out! No more RNs sneaking up on me to grab a quick sample of blood while I’m fitfully trying to ignore the bed constantly breathing underneath me (anti bed sore feature). Ambien and I don’t get along well and I only use it if I absolutely have to have sleep. Some of my most bizarre dreams are ambien based. I think this stint in the hospital clued me as to why its so weird. I had a couple of events where I closed my eyes and when I opened them, 20 minutes had passed. I think ambien affects the internal sence of time. As for the dreams? Well not only am I narcoleptic (hot and cold running lucid dreams) I also currently have that “Australian Flu”…. my dreams are full on right now. I woke up this morning complaining in “Swahili”…of which I don’t speak a word… that some f—-er had made me white and British, when everyone knows I am black and from Africa ! (I AM a white Brit)…. That was a little random! As some of you know, I’m a retired USN CPO. As such, I have two tours as an instructor under my belt. During my nightmare evaluation at Navhosp urgent care center, I found myself grimacing in pain as two corpsman were drawing about 20cc of blood from each arm… laying there in saturated adult diapers and running a fever. While this was going on, a collection of trainees were walked into by bed area to see how it’s done. Joy, I became a training device. I didn’t really mind, but what pissed me off was when I looked up and noticed one of the trainees giving that tell tale “not there” stare and nearly dozed off. As an instructor, you pick up on clues like that pretty fast. Not wishing to extend my pain, I just grimaced and waited it out. However, before checkout today, I did point the event out to the nursing staff. The final disposition was a non resistant strain of staphylococcus had invaded my bladder. Once they got a good handle on what version it was, they tweaked my antibiotics IV to target it and kill it off. That infection was probably part of the reason I was having so much trouble controlling my bladder. Part of it could have been my fault because I had cut back on my fluid intake to lessen the bladder control problems. With less flow, the staphylococcus had a chance to travel upstream and attack my bladder. Embarrassed? Yup. I’m on follow-up antibiotics and will hit every dose at the prescribed time. Glad you are out. Good luck in your progress! I do hope you can recover fully so we get more of these entertaining and woefully off-topic monologues! They are still ongoing, but only via txt msg with close freinds. The mainly consist of me bemoaning the situation and are generally quite vitriolic. Sounds perfect! I finally heard from one friend and she had mersa, (again), she sounds good, other friend is finally coherent and is going to rehab center for 6 weeks to learn to breathe again, they were able to remove the breathing tube on second try. I don’t ramble too much but this flu season is scaring me. I tend to be somewhat of a recluse as it is. This med stuff sort of forcing me to be even more secluded isn’t going unappreciated. Sure it’s 2018 and the flu is getting hairy, but don’t forget that 1918 H1N1 did really bad damage during its run as well. One of it’s tricks was generating an over-response in what we’re strong immune systems. I think it is referred to as a cytokine storm. Caveat: Not a medical person, just some sick dude hiding out in my house. Exact, as some young and healthy individuals experienced deadly high fevers in response to a moderate infection. It was the body’s overreacting that killed them, with extreme fever leading to brain damage, and dehydration, which also could cause brain damage. Pretty nasty. I was fighting a similar infection all summer and into the fall. that and some other issues with my replacement hip surgery was why i haven’t been posting much either. cheaper than hospital, and eventually your control issues should be over..
Bladder infection. Just hearing that makes me break out in sweats. Glad they were able to target it. Now to get yourself back up to par. Also with today’s technology, the simple cell phone, it was nice that you were able to still stay in contact with everyone on here. Back on Iceland the Q swarm at Grimseya goes continues with a fresh green star.I think all tectonic… Obviously some tensions builds up there that has to be released then and now… Wonder what movements are causing this. Spreading over the neighbouring MAR, plume pulse, or….? It is a transform fault which has to respond fairly frequently to the spreading of Iceland. This kind of swarm happens every few years: it is not volcanic. On the other hand, Bardarbunga has recovered from the 4.9 rather fast, with M2’s today, Grimsvotn is shaking (minorly, addmittedly) and Öræfajökull remains busy. Interesting times. Only followed Iceland geology for 7 years but seen these swarms at Tjoernes Grimsey or Reykjanes ridge are coming and going. Is it tensions building up slowly that are released when stress tresholds are reached or could it result from waves/pulses from deep below that trigger MAR spreadings and other movements? Good question. They seem too regular to be caused by these pulses. The pulses manly show up close to the spreading ridge. If you go further, the plate motion becomes very smooth and regular. So I suspect this is just the regular building up of tension. The swarms are not always in the same place, by the way, so stress transfering from one section of the transform to the next will play a role. Magma from the plume extends far north, west and southwest from Vatnajokull. This was shown in studies. So that magma reaches under both Tjornes and Reykjanes, at depth (upper mantle). There is no research done on this. So it does constitute a good research topic. What we know us that the plume “pulsates” every 120-160 years, correlating with a general increase in volcanic activity all over Iceland but especially near Vatnajokull. Perhaps those earthquakes near Lake this week, are part of that. And certainly the awakening of volcanoes like Bardarbunga, Oraefajokull or Tungnafellsjokull. Transform faults in Iceland are volcanic. There are active volcanoes in SISZ (a transform usually non-volcanic region), Hifsjokull-Langjokull transform fault, and in Tjornes. Eruptions do happen but they are rare and small. In Tjornes they happen mostly underwater too. In Iceland, magma can find its way upwards along transform faults, even though if it’s not easy feat for the magma. True. They are much less active than the spreading ridges but not silent. I believe that these swarms in the north are tectonic only, though. I agree the activity was tectonic, but those sub 20km earthquakes are going to have a magmatic element to them and are probably due to magma influx into any voids left by the tectonic shifting above. These transform areas do have a habit of starting tectonic and evolving through to magmatic as the tectonic activity weakens any overburden pressure above the MOHO. I’m not convinced this quake is part of the southern rim fault. I’m putting my money on an intra-plug quake based on dip angle with depth and location plotting relative the caldera. After checking a better map I have to agree. That looks more like intra-plug action. I still think we will see a large one on the south side quite soon though. Exiting silence! Sooner or laterwe will see if your prediction/hypothesis is right! Its been a bit slow with the articles recently, I know they take a while to write and research but I dont think theres been a week without an article since the 3 weeks between two NDVP articles in 2016. Is the woolly mammoth guide to Iceland part 3 on the way? Sorry if I come off as being rude Im just a little bit bored for reasons unrelated to here. I think Albert’s got one in the pipeline for this week, so not long to wait. Carl did have one due last week, but he’s busy planning a trip to the earth’s core, building a magma powered superweapon and screaming at the sun to appear. I’m busy juggling a newborn and a three year old. Although I do have two up my sleeve once I get time. Lurk’s just been released from the mental asylum. Andrej’s computer is cooling down after the last plot-fest. The others are either hibernating or bathing in the souls of their antagonists. Oh no, nothing to do with that… he chewed through the chains. Again. He can’t photosynthesise and he’s on day 400+ of no sun in a cool and cloudy southern Sweeden. Short documentary on the halemaumau lava lake, made on Jan 31st so very up to date. Im actually suprised at how very few articles there are on this site about kilauea, or hawaii in general. Especially as it contains the dubious but not unreasonable title of most active volcano on earth. I guess HVO and (literally) millions of tourists is good for that but still. New post is ready! It is Mexico, and it is 1982.